1.The students of Department of Commerce visited Shital Fabrics and Shital Export house on 6th September 2017. the students observed the manufacturing of blankets and carpets. The visit was an enrichment for the students by having a first hand experience of an industry. 2. 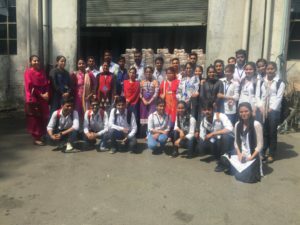 The students visited Punjab Kesari Printing Press on 15th March, 2018. the aim of the visit was to provide oan insight regarding internal function of the industry. On 3 March 2018, Department of Commerce & Computer Science organized trip to Dalhousie and Khajjiar. 54 students of B. Com ,BCA and M.Com. along with 3 faculty members Asst. Prof Navdeep Singh, Asst. Prof. Megha ,Asst. Prof. Harpreet Kaur. Students enjoyed snowfall at snowpoint near Khajjiar. They visited Khajjiar. The location was awesome and it was surrounded by trees and mountain. The weather was soothing with cool healthy air and rainfall which we will never experience. At last they enjoyed dinner at Anupurna Dhaba together and came back by 11:45 pm. Through the trip the students and faculty refreshed and enhanced fraternity among them.